Recently I have received many questions regarding triathlon race tires and I wanted to discuss my selection of the Continental Attack / Force combo for my own Sprint, Olympic, Half-Ironman, and Ironman triathlon racing needs. Rolling Resistance - The better a tire rolls the less energy it takes to get to the finish. The difference between your race tires and a competitors could easily be 20 watts. Imagine that you put out 170 watts but used the slower race tires - you would effectively go the same speed as someone that put out 150 watts but with the faster tires. That is a huge difference. There are various sources for rolling resistance out there but the front runners include the following: Continental Attack / Force, Continental Supersonic, Vittoria Evo Corsa, Veloflex Record. Aerodynamics - The other quality that can really slow you down or make you fast is aerodynamics. It has been shown that the wider you go in tires (given the same construction of tire) the less rolling resistance is. However at some point the wider tire and low rolling resistance doesn't offset the higher aerodynamic drag that is created. There are far fewer sources on aerodynamic data but data from Zipp, HED, and Trek suggest that the Veloflex tires and Vittoria tires are not that aerodynamic. Continental tires have always been shown to be good performers aerodynamically. Specific data from Zipp has shown that both the Continental Attack and GP4000s are great performers with Zipp rims. HED and Bontrager have shown similar results for their rims. Of the four tires listed above I have to cross out the Veloflex and Vittoria tire. Durability / Puncture Protection - Durability is an interesting topic as I often believe that things that go through one tire go through another. Most people are way too conservative when it comes to durability and worry way too much about flats. The Supersonic rolls extremely well and is aerodynamic, but it doesn't have a puncture protection strip and doesn't have a lot of tread. In practice I find it durable and have used in races of all length without incident, but I think for most people that going with the Attack / Force is the better route. Continental is widely-known to have great puncture protection with their Vectran breaker and having this in the Attack / Force gives you the piece of mind that if you get a flat that you would have gotten a flat in any tire. Other Qualities - The deal breakers for me are rolling resistance, aerodynamics, and durability, but I wanted to mention that Continental tires in general handle great on both dry and wet pavement. In addition, they have a wear indicator built in to tell you when the tire needs to be replaced. They are also very light tires for how durable they are and the 24mm Force weighs ~195 grams and the 22m Attack at ~180 grams. The Continental Attack / Force tire is my race tire. If you are racing on something else consider converting those tires to training tires and grabbing a new pair over at Trisports. New tires in general are more aerodynamic than worn tires anyway. You can always save 20% at Trisports on these tires by using my coupon code. Each code is unique for you so please contact me thru the above "Contact" tab and I will email you back the 20% off code. Codes can be used at anytime - no waiting for a special sale. They expire 12/31/14. Please remember to fill in your email address so I can reply back to you. If you don't provide an email there is no way for me to contact you. You can also tweet at me or message me on Facebook if you prefer.. Even if you already ride the Continental Attack / Force combo, this is great opportunity to purchase your next set and help support me in the process. Below I answer specific additional questions that people have asked in other places. 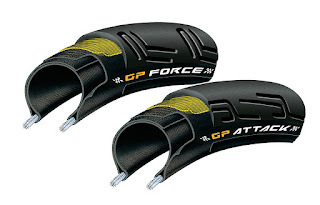 Why do you think the Attack/Force combo is better than the GP4000, GP4000s or the GP Triathlon? Is it because the Attack (front tire) is 22mm and the Force (rear tire) is 24mm whereas the GP4000 only comes in 23mm and 25mm? In comparison, Jordan Rapp is running the Zipp Tangente (21mm in front and 23mm in back) on his Shiv. I don't want to speak for Jordan, but he would probably tell you that he runs the 21mm front because it is slightly more aerodynamic than the 23mm upfront on his Zipp 808 Firecrest rim. Zipp has demonstrated that both the Attack and 23mm GP4000s perform admirably from an aerodynamic standpoint on the Zipp 303 Firecrest rim. The 25mm GP4000s doesn't perform as well. The Attack performs a little better at lower yaws, and the 23mm GP4000s at higher yaws. With that being said the 303 is wider than the 404 and 808 and I'm confident that the 22mm tire is a better aerodyanamic fit for those rims. By the way, the GP4000 does come in 20mm, you just have to be sure if you want the Black Chilli compound that you buy a black tire. Black Chilli doesn't come in the colorized tires. The 20mm tire might be even a better fit aerodynamically, but then again so might the 20mm Supersonic. The Supersonic rolls better than the Attack, and the Attack rolls better than the GP4000s. I don't think you can go wrong with either tire upfront but I like the handling of a little wider tire and the durability that comes with the puncture strip. As for the GP Triathlon. I believe that tire is being phased out but it is essentially the same tire as the GP4000s just with a completely smooth tread. Having ridden the Conti Attack- Force combo on British roads I've found the combination to be rather slow feeling and certainly don't feel as confident road racing on the tires- They just seem to psychologically take away the edge for me. I have heard of many guys racing Ironman's on Gatorskins so these have to be an upgrade for them but in my head these are only a tire I would use if I take a spare wheel from the pits. I just used Gatorskins at IM Galveston and less than a week old they flatted on light glass on the roadside. My old tires made it farther than that with multiple glass exposures.